The Japanese anime In This Corner of the World recreates wartime Hiroshima and its neighboring port city of Kure through the eyes of a young woman and her family. It’s personal, emotional and deliberate, and by the time the Allied planes are flying overhead, you’ll have forgotten that this is all leading up to two nuclear bombs being dropped on Japan. In This Corner of the World is abnormally slow-paced, philosophical and patient in ways that even most Eastern animations aren’t. Our window into Japan is the sweet, unassuming Suzu Urano (Non), soon to be married to Shusaku Hojo (Yoshimasa Hosoya). 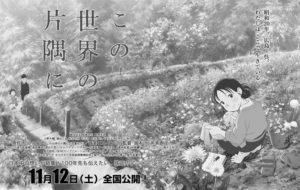 The story begins with Suzu as a child in the 1930s, when her family runs a seaweed fishing business in a quiet seaside town. In This Corner of the World watches the characters sail on the ocean in gorgeous long shots, and the film later indulges Suzu’s fantasies as she tries to make her little sister giggle. There isn’t a plot, per se, in these early segments — an audience will have to wait until at least the hour mark before the film gains any sort of narrative momentum. But there’s a delightful humanism in the vignettes, something beautiful in its existential focus. Suzu takes her sketchbook down to the sea to paint the white caps hopping like rabbits in the waves, and life seems innocent and still, immovable and eternal. Before long, the industry of war undercuts the joy and purity — Japan’s involvement in the global conflict looms large over the characters — but co-writer and director Sunao Katabuchi keeps his story focused on the families. Suzu, her family and Shusaku’s family drive this story. We’re with them when their food gets rationed during the war years, we’re with them when the air raids begin, and we’re with them when they’re digging out shelters. Suzu flexes her inner creative culinarian during these years of intense rations, telling the audience how to puff up rice overnight to make it taste richer and to tease out the minuscule portions. It’s a YouTube cooking tutorial by way of watercolor animation. Suzu remains optimistic and the grass on the Japanese hills remains green, but the cities of Hiroshima and Kure take on a muted, dull palette — a nation on the brink of fading away. “It’s a waste of salt to cry,” someone reminds Suzu. In 1945, when the low rumble of incoming bombers rises over the mountains, Katabuchi’s editor does not dwell long on the planes. Instead, in a brilliant expressionistic sequence, the Japanese anti-aircraft guns target the Allied bombers, and the gunshots explode in the air in clouds of green, yellow, red and blue. Suzu watches from below, wishing she’d brought her sketchbook. Many stylistic sequences crop up during In This Corner of the World, from a series of slapstick snapshots with Suzu and Shusaku to a scene where Suzu is lost in the rich quarter of the city and the smells quite literally drift off of the upper-class women she encounters. These segments are quirky and welcome moments of levity tucked away amidst the muted drama. In This Corner of the World is animated in a hand-painted watercolor style that lifts beauty from the mundane. The film often utilizes long, wide shots, dwarfing its characters in their environments. The movie wants to spend as much time as possible watching those clear skies and sunsets before the sun is blackened out by ash. And Katabuchi is in love with the little details, too, like the steam that rises from the stove and the smoke from the chimney and the breath from frigid mouths, all of which come out in exaggerated clouds that loiter in the air. Suzu blushes in rosy hatch marks and loose dandelion seeds sail thoughtlessly across the clouds. “Even in war, cicadas cry and butterflies fly,” Suzu says, and that’s what In This Corner of the World captures most elegantly of all. Katabuchi’s story doesn’t have a narrative outside of these loose vignettes. Other than the threat of the next bombing and the ticking clock of nuclear devastation, we have nothing driving Suzu’s story except Suzu herself. Is she going to go back to Hiroshima or stay with Shusaku? Will she finally tell the handsome sailor Tetsu (Daisuke Ono) how she feels about him, or will she stay loyal to her husband? Will the cold-hearted widow Keiko (Minori Omi) ever accept Suzu as a member of the family? These small conflicts are the story. They rarely involve shouting or tears, instead opting for more realistic moments of quiet conversation over dinner or just before bed. Katabuchi has told one of the most understated war epics in cinema. His Empire of Japan is calm and silent. We see wives hanging wet bandages on clotheslines, not soldiers fighting overseas. Warships rest in the background in the bay of Kure. We never go aboard them, but they’re always there. The deaths are quick and unexpectedly devastating. We almost never know the characters that die on-screen, but the film’s final act is nevertheless a tragic, emotional march sure to bring tears. Each loss is more devastating for what it represents: The gradual death of an innocent Japan. Just as Suzu walks through Hiroshima with her sketchbook, drawing the loveliest buildings with graphite and ink, so too are Katabuchi and company using their film to paint a portrait of 1940s Japan. It’s a world that will never return. Their endeavor becomes one of immortalizing a time of innocence — that calm, that composure the war took away forever. It’s a salient reminder of the cost of nuclear warfare, a warning for the future. Katabuchi’s film is the kind of solemn, personal tragedy that audiences don’t see often enough in this corner of the world.